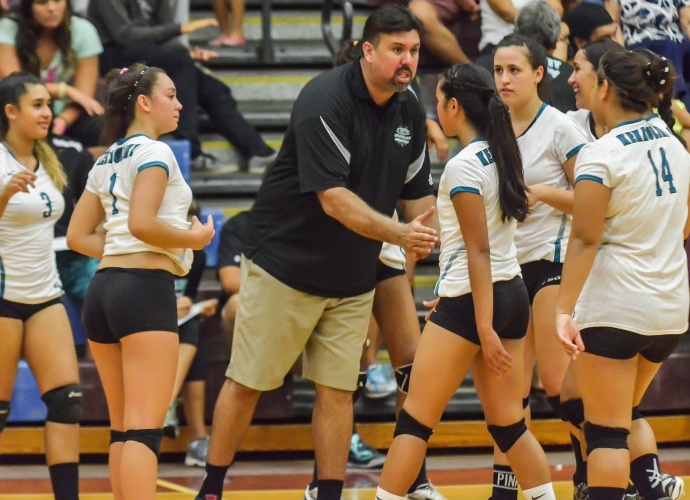 King Kekaulike head coach Al Paschoal with his team during a time out earlier this season at Baldwin High School. File photo by Rodney S. Yap. The King Kekaulike girls volleyball team looked primed to shut the door on Kapolei Saturday, winning the first two sets in convincing fashion before the visiting Hurricanes unleashed their own fury. The Oahu Interscholastic Association team weathered the early storm, before finding its rhythm and confidence, rallying for a five-set victory 22-25, 19-25, 27-25, 25-18, 15-8. 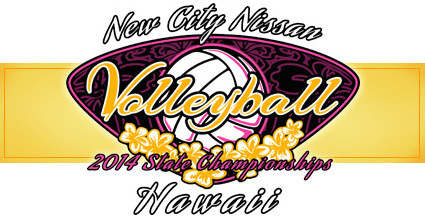 The quarterfinal game in the New City Nissan Division I Girls Volleyball State Championship was played before a packed Kaulaheanuiokamoku Gym on the Kamehameha Maui campus. Kapolei (13-3) will face top-seeded Kamehameha Kapalama (16-0) in the semifinal round Friday at the McKinley High School on Oahu. The fourth-seeded Na Alii (12-2) led 13-8 in the third set before a kill-attempt by Breannalye Rodrigues sailed wide right with Kapolei’s Jayleen Abregana serving. The error gave the Hurricanes a 19-18 lead. 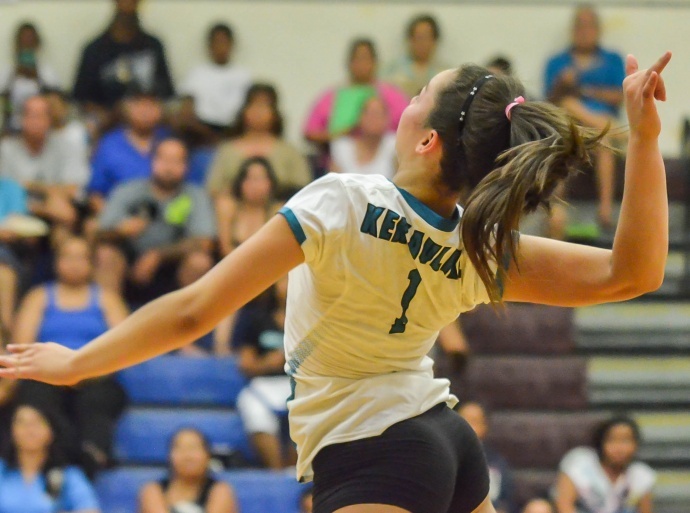 King Kekaulike’s junior outside-hitter Treyanna-Lee Freitas finished with 10 kills against Kapolei on Saturday. She is shown here in this file photo earlier this season against Baldwin. Photo by Rodney S. Yap. King Kekaulike’s Treyanna-Lee Freitas served one of her five aces to tie the set at 24-24, and her back-row kill kept the Upcountry school in it at 25-25 before Kapolei closed things out. 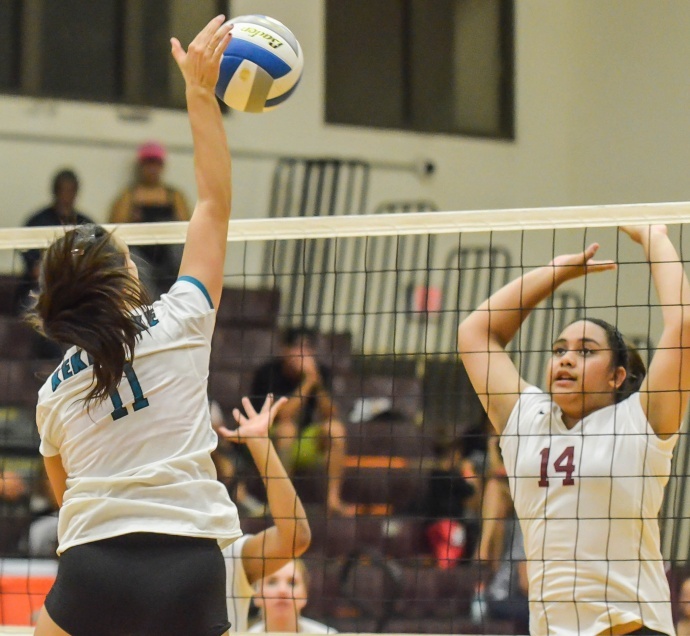 King Kekaulike would end up trailing by as many as 10 points in the fourth set, 16-6, after Malia Transfiguration served five straight points for Kapolei. 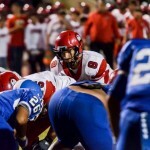 Na Alii got no closer than six points the rest of the way. The fifth set was all Kapolei as the visitors jumped out to leads of 1-9 and 3-12 before putting the home team away. Shekinah Clarke led the Hurricanes with 20 kills and hit .421. 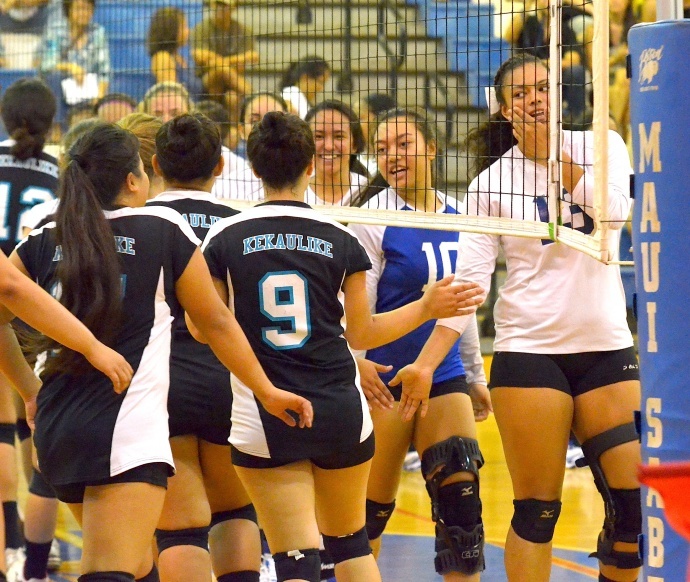 Kapolei finished with a .035 hitting percentage in the match to King Kekaulike’s .012. Na Alii had 81 digs, to the Hurricanes’ 71, Freitas had a team-high 23 and Transfiguration a game-high 35. Rodrigues had 12 kills for Na Alii, Freitas added 10. Punahou (13-3) beat Kamehameha Hawaii (15-1) 25-15, 25-17, 25-15 in other quarterfinal action Saturday, and Castle (9-7) defeated Nanakuli (9-5), 24-26, 25-22, 15-11, in a consolation match. 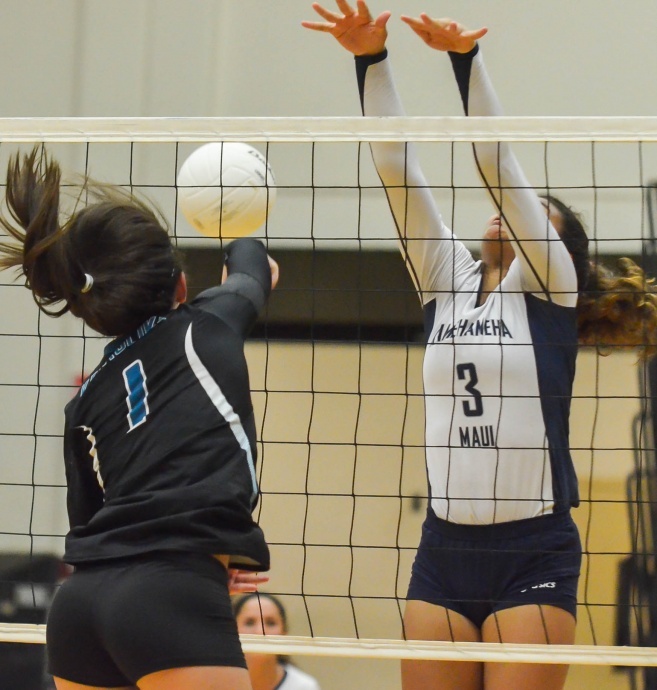 Kamehameha Maui fell short to Mililani in a consolation match Saturday on Oahu. The loss capped the Warriors season at 10-5. Danielle Brown led KS-Maui with 10 kills and 6 digs. 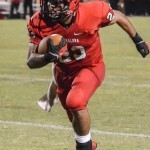 Selai Damuni added 7 kills. Aliyah Ayau finished with 23 assists and Kaala Corpuz had 7 digs. Mililani (12-3) was led by Katie Asbury’s 7 kills. On Friday, Kahuku defeated Kamehameha Maui in straight sets 25-11, 25-16, 27-25. The Red Raiders (13-2) were led by Phoebe Grace and Carey Williams finished with 9 kills and three blocks apiece. Williams also had 7 digs. Jamie Niutupuivaha added 7 kills in eight attempts, hitting a whopping .875. Kahuku dominated the match hitting .500 as a team in the first set. Sharae Niu had 36 assists and Rachel Blake contributed 14 digs. The Warriors were led by Brown’s 7 kills and 9 digs. Damuni also had 7 kills and two digs. Ayau finished with 20 assists for KS-Maui, which committed 13 errors in the second and third sets.